Thursday, September 13, 2018 - Just like Kenyan cops, Nigerian police operate with a lot of impunity. They behave as if they are above the law. 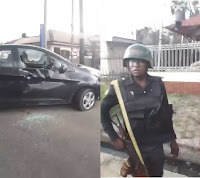 This Nigerian man cried out after cops shot his car 4 times and tried to arrest him for overtaking them.